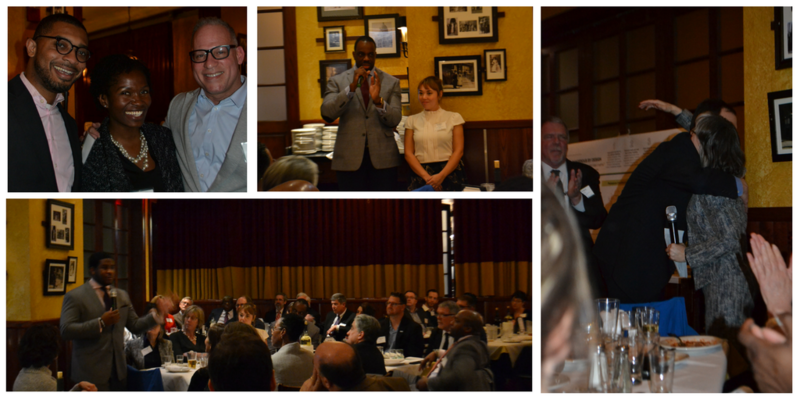 Last week during the 2018 Transportation Research Board meeting, the National Complete Streets Coalition hosted the Eighth Annual Complete Streets Dinner in Washington D.C. We were joined by over 70 Complete Streets partners, advocates, supporters and friends who came together to share a meal, get to know each other, and celebrate the Coalition’s 2017 milestones. 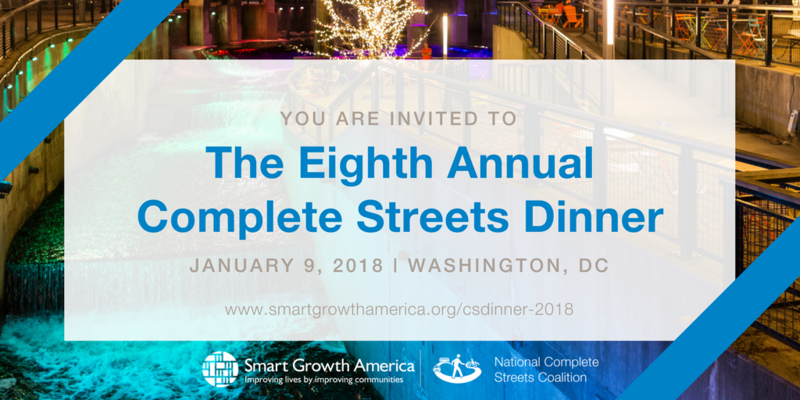 You’re invited to join the National Complete Streets Coalition at our Eighth Annual Complete Streets Dinner, held on Tuesday, January 9, 2018 in Washington, DC. Conveniently scheduled during the 2018 Transportation Research Board meeting, this intimate and fun event brings together top Complete Streets professionals, policymakers, supporters, and friends to celebrate the successes of the Complete Streets movement in the last year. Left: Commissioner Polly Trottenberg delivering her remarks. Right: Trottenberg speaking with Governor Parris Glendening. The National Complete Streets Coalition hosted our Seventh Annual Complete Streets Dinner last Tuesday evening, January 10, 2017. More than 60 advocates, supporters, partners, and friends gathered in Washington, DC to mingle, share ideas, and commemorate an eventful year for the Coalition. Geoff Anderson, president and CEO of Smart Growth America, delivered a brief address welcoming guests to the dinner before passing the microphone to Art Guzzetti, vice president of policy at the American Public Transportation Association and a member of the Coalition’s Steering Committee, who introduced the Coalition’s partners and sponsors. Coalition director Emiko Atherton recounted our accomplishments over the past year, including surpassing 1,000 Complete Streets policies nationwide and introducing a new strategic plan focused on implementation and equity. Before you head home for the holidays, make sure to secure your ticket to the National Complete Streets Coalition’s Seventh Annual Complete Streets Dinner, to be held on Tuesday, January 10, 2017 in Washington, DC. Conveniently scheduled during the 2017 Transportation Research Board meeting, this intimate and fun event brings together top Complete Streets professionals, policymakers, supporters, and friends to celebrate the successes of the Complete Streets movement in the last year. Join the National Complete Streets Coalition at our Seventh Annual Complete Streets Dinner, held on Tuesday, January 10, 2017 in Washington, DC. Conveniently scheduled during the 2017 Transportation Research Board meeting, this intimate and fun event brings together top Complete Streets professionals, policymakers, supporters, and friends to celebrate the successes of the Complete Streets movement in the last year. 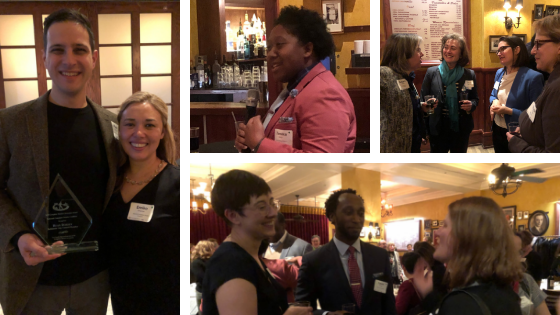 On Tuesday, the National Complete Streets Coalition hosted our Sixth Annual Complete Streets Dinner at La Tasca, in downtown Washington, DC. The evening assembled over 50 advocates, supporters, partners, and friends to celebrate 10 years as a Coalition and over 845 Complete Streets policies passed at the state, regional, and local level. Coalition Director Emiko Atherton, Steering Committee Chair Rich Weaver, of the American Public Transportation Association (APTA), and Smart Growth America President and CEO Geoff Anderson kicked off the evening with welcomes and an introduction of the dinner’s distinguished speaker, Gregory Ballard, former mayor of Indianapolis. The National Complete Streets Coalition will host its annual dinner next month—and we hope you’ll join us! This year, we’re honored to have Rina Cutler, Deputy Mayor for Transportation and Utilities for Philadelphia, as our featured guest. Hailed as a Public Works Leader of the Year and one of COMTO’s Women Who Move the Nation, she recently led efforts to develop Philadelphia’s Complete Streets Design Handbook, a model for Complete Streets implementation. Philadelphia Mayor Michael Nutter appointed Ms. Cutler to her current position in 2008, where she is responsible for coordination and oversight of all transportation functions and several city agencies. The National Complete Streets Coalition’s annual dinners bring together the top minds working for Complete Streets across the country, including our national Steering Committee members, our well-known corps of workshop instructors, staff from our Partner organizations—and you! Together, we’ll celebrate recent Complete Streets successes nationally and locally and forge friendships with colleagues and peers over informal discussion. We’ll be dining on Tuesday, January 14, 2014 in Washington, DC’s Woodley Park neighborhood. Seats are available for $150. Head table seats are available for $200. Click here to reserve your tickets online. 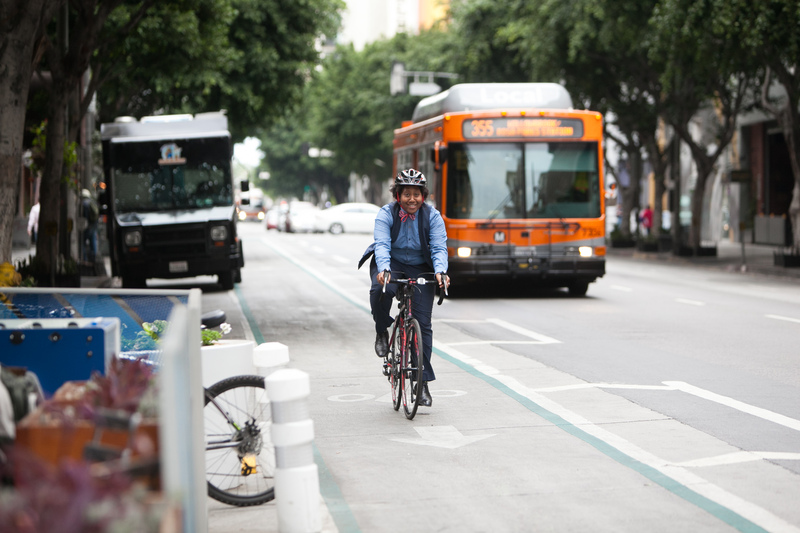 Current and new Complete Streets Partners receive a significant discount, and Partners at the Silver level and above are eligible to receive complimentary seats.